Torchlight 2 SynergiesMOD on MODDB's mod of the year! That's right, its that time of the year! MODDB has put up their Voting booth for nominations of MOD OF THE YEAR. In order to vote you have to go to the mods page and click "VOTE FOR THIS MOD" to help it get into the nomination phase. SynergiesMOD represents so much time and effort on mine and my teams behalf that even if you personally dislike the mod, you should consider the fact that it brings a fairly large chunk of content to the genre with enjoyment and balance in mind! It is our best chance at getting Torchlight 2 and ARPG's even more justification on HOW they should be made. No DRM, Moddable and made to be FUN. The big block ARPG's would stifle our ability to mod, but this is our chance to show that the indie developers did it right, and that the fans of that franchise (synergies, and ALL modders) have what it takes to take on halflife, total war, company of heroes and so many other epic games! 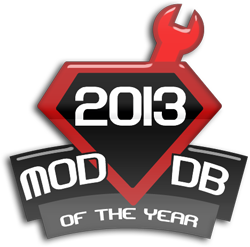 Please, go to SynergiesMODS moddb site, and nominate it for mod of the year. After nominations, please return and vote for it as mod of the year. Torchlight2 gains by the exposure just as much as myself and all other modders do. I don't care for decrepit, peasant mod nonsense. Either they release an official expansion/DLC or nothing. But Runic obviously stopped caring about this game a long time ago, not to mention it doesn't have rag-doll physics so the game feels flat anyway. this is a mod forum, if you don't care for it please stay away, stop the trolling!